Agapanthus africanus is native to Southern Africa. It is grown for the dark, glossy, strap-shaped leaves that arch gracefully. Flowers are borne on long erect stems 3 feet or taller. Agapanthus make good background plants or edging along a fence, driveway, or wall. These plants can thrive on conditions of neglect and naturalize readily. They also make excellent tub and container specimens and can be used in cut flower arrangements. In cold winter areas they can be brought indoors for the winter. 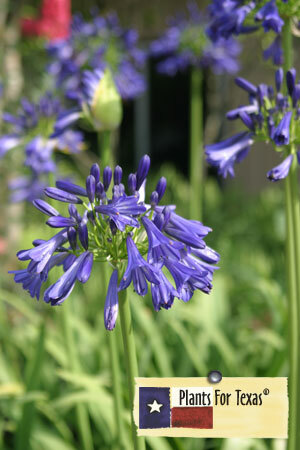 Agapanthus x ‘Ellamae’ is an Archie Armate introduction with dark blue/violet flowers on a 5 to 5.5 foot flower stalk. Plant height is 30 to 36 inches with a pendulum (weeping) leaf habit. ‘Ellamae’ is great for attracting bees, butterflies and hummingbirds into the garden. This is a very vigorous grower and is a cross, possibly between A. africanus and A. praecox ssp. orientalis. Agapanthus x ‘Ellamae’ is part of our Plants For Texas® Program, meaning it was Texas Grown, Tested in Texas to perform outstanding for Texas Gardens.